We’re back! 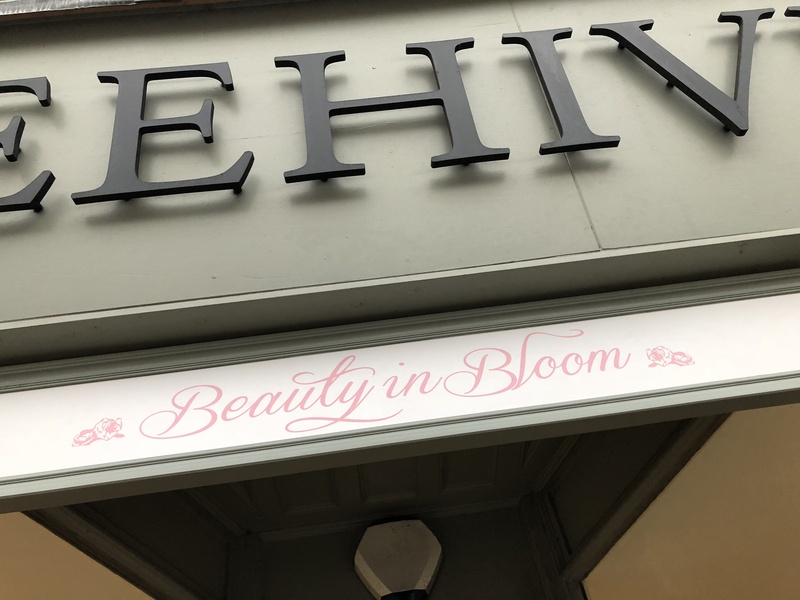 So September came and went, and unfortunately due to our lovely refurbished salon keeping us very busy there was little time to post last month. But now we’re well into October, Autumn is here (although incredibly mild), and there has been lots happening and as promised I thought I’d give a little update with a sneak peek too!! 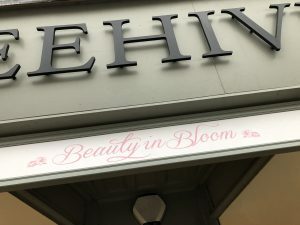 I would like to thank everyone who came along to our open salon event a couple of weeks ago, we hugely appreciate all your support and kind words, so thank you! The event was a great success and we’re very happy with our brand new look. Last month, Katherine and I had the pleasure to team up with some fantastic Yorkshire Bridal suppliers. The lovely Ester Day from Your Days By Design organised the editorial shoot and kindly invited us to do the Hair and Makeup. 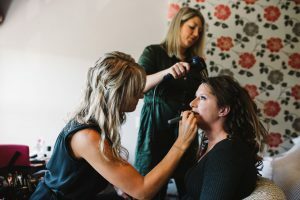 She had arranged for the shoot to take place at the stunning Devonshire Fell Hotel in Burnsall and the day was hosted by Hannah Crosdale, Wedding Coordinator. We had been given a colour palette of champagne, blush, mauve and burgundy with metallic rose gold to work with and this was perfectly complimented by both Vanessa at Wildflowers and Sitting Pretty Chair Covers who created a beautifully romantic feel to the Wedding breakfast room at the hotel with their decorations. Esther also incorporated this palette into her delicate yet on trend design for the stationary, which included the table names and plan, welcome sign and invitations. There were two looks for the day, and both dresses were kindly provided by Amelias Bridal Boutique. Each one worked incredibly well within the luxurious intimate setting of The Fell. Our first look was a strapless dress with a sweetheart neckline, embroidered bodice and lace skirt with a long train, this was styled with a large bouquet of wild flowers, ivy and roses and held together with hand died silk ribbons from Northern Hands. I kept the makeup natural but enhanced Hayley’s eyes with some individual lashes, gold tones and a subtle liner. Hayley has fantastic skin so we kept her foundation coverage medium and ever so slightly contoured her cheeks. Katherine created a half up, half down look with loose curls and a braid which has been a very popular look for 2018. For the second look, Katherine put all Hayley’s hair up keeping the braid to one side but using the loose curls to twist in a beautiful style at the back. I added a pop of colour to this look and used Beauty Boulevard’s brand new Mattitude Lip Liquid, in Secret Passage. I am beyond impressed with this new matte lip product, it applies so easily and lasts for hours. There is no residue left on your teeth (a problem I have all the time) and it works perfectly with the new Diamond Lip Gloss to add shine. The dress had a full tulle skirt, lace sleeves and bodice with an open back, the bouquet was slightly neater in style, again with roses and other florals but with bolder yet muted greens. 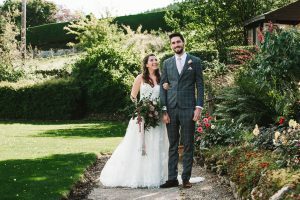 The Groom definitely looked the part too in his country inspired grey tweed suit by Marc Darcey from Jenson Samuels in Skipton. To complete the entire look throughout Poppy Pickering Cakes provided a three tier simple, white but delicately designed cake accompanied with a floral design from Vanessa. And to create the perfect spot for an intimate cocktail and canapé Brides Little Helper used “it was always you’ neon sign to light up the summer house. We were extremely lucky on the day with some gorgeous Autumnal sunshine, meaning we were able to make the most of the breathtaking surroundings of The Fell in Burnsall. 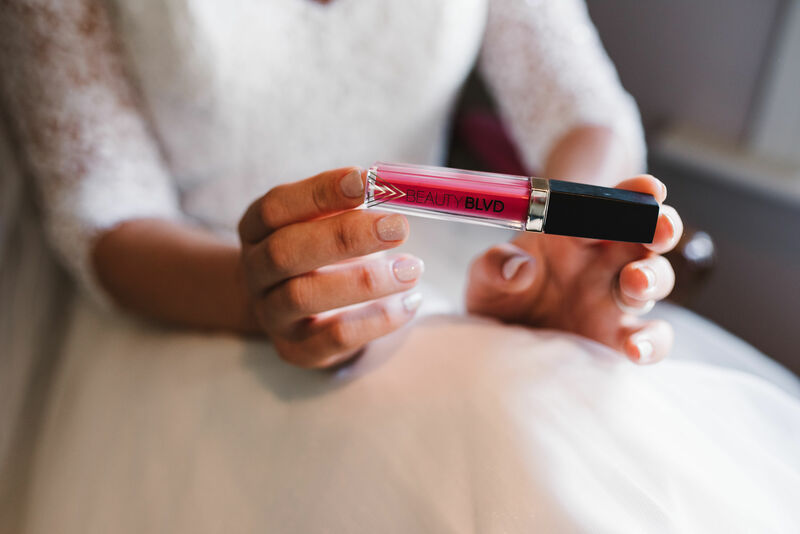 This was all captured brilliantly by the incredibly talented Georgie from Georgina Brewster Photography. I have worked numerous times with Georgie throughout the year and can honestly say its an absolute pleasure every single time. Together with the photographs there will also be a short video shot by the highly professional team from VIP Worldwide. And of course no photo shoot is complete without the models, and I must say the success of the images was made so easy by the professionalism and experience of Hayley Pegg and Luke Derbyshire. I can’t wait to show you the entire collection of photos from the shoot but they are currently under wraps! So for now I’ve been given special permission to post just a couple as a sneak peek….enjoy!